The Cboe Volatility Index, known as the VIX, hit its lowest level since Oct. 5 on Tuesday. For investors looking for a hedge in case reality falls short of expectations, here are some strategies that worked well in the past when volatility spiked. Long-duration and intermediate-term U.S. Treasury bonds as well as safe haven gold have significantly outperformed the S&P 500 since 1999 whenever volatility has spiked. The market has been eerily quiet, perhaps too quiet. 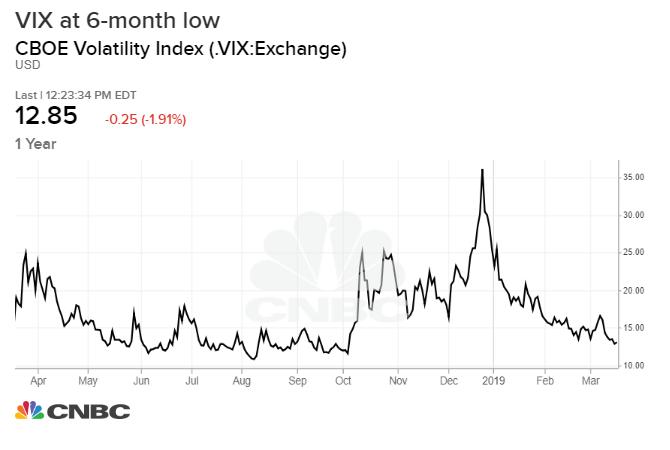 The Cboe Volatility Index, a measure of the 30-day implied volatility of the S&P 500 known as the "VIX" or the "fear gauge," hit 12.37 on Tuesday, its lowest level since October. Volatility collapsed as the stock market was quick to fully make back the losses from its December bloodbath. But periods of calm like this don't last much longer, history shows, and it seems the market may be pricing in too rosy a scenario — a completely dovish Federal Reserve, a pro-growth trade deal with China and an earnings growth pickup later this year. CNBC analysis using Kensho, a hedge fund analytics tool, found which exchange-traded funds outperform when the VIX pops more than 8 points in a short period of time. A jump of that magnitude would return the volatility gauge to the 20 level where it spent most of the tumultuous fourth quarter. 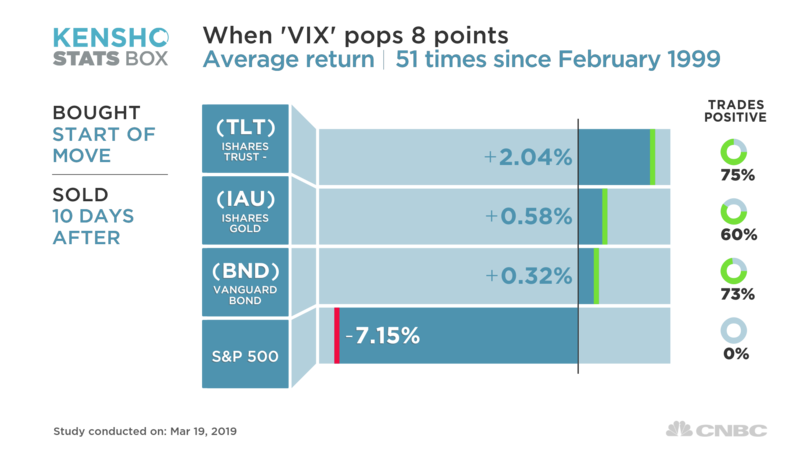 Long-duration and intermediate-term U.S. Treasury bonds as well as safe haven gold have significantly outperformed the S&P 500 whenever volatility has surged. The iShares 20+ Year Treasury Bond ETF has returned 2 percent amid a 10-day period of market turmoil, and iShares Gold Trust and Vanguard Total Bond Market ETF also held up. The most imminent risk to break the market peace is the Fed's policy decision Wednesday, where investors will look for further details about the pivot to patience on tightening and the balance sheet run-off. "If the Fed fails to communicate an increasingly apprehensive outlook and willingness to remain on hold for the foreseeable future, risk assets will undoubtedly underperform – thereby tightening financial conditions as equity volatility spikes," Ian Lyngen, BMO Capital Markets' head of U.S. rate strategy, said in a note. To be sure, there are no shortage of reasons to bet that things can stay smooth for a while. The Fed could very well deliver the message investors crave and there are signs that the U.S. and China might soon work up a trade deal. Wall Street is in fact bullish on stocks for the most part. The average S&P 500 target for 2019 from the 17 top analysts is 2,947, more than 100 points than current levels, a CNBC analysis shows. Credit Suisse raised its year-end forecast for the S&P 500 to 3,025 from 2,925, saying the "receding" risks will drive the market higher. CNBC's new newsletter, delivering the week's most actionable big data insights from CNBC and Kensho, a quantitative tool used exclusively by Wall Street's top trading firms...and CNBC. Get this delivered to your inbox, and more info about our products and services.